We did it! Two weeks after first having killed the Twin Consorts, we attempted Lei Shen for the first time. After seventeen wipes, we managed to kill him! I’m very excited and extremely relieved. I still want to repeat it for the people who weren’t there, get more gear, and maybe push some heroic bosses for gear, but this was the big moment. Especially considering that there’s no way we’re going to finish heroic mode by the next patch, this was the big “end game” goal for us for this tier. It’s also special for me. I’ve been raiding this tier with the guild, Carpe Flux Capacitor, since the beginning, and now it’s completed. 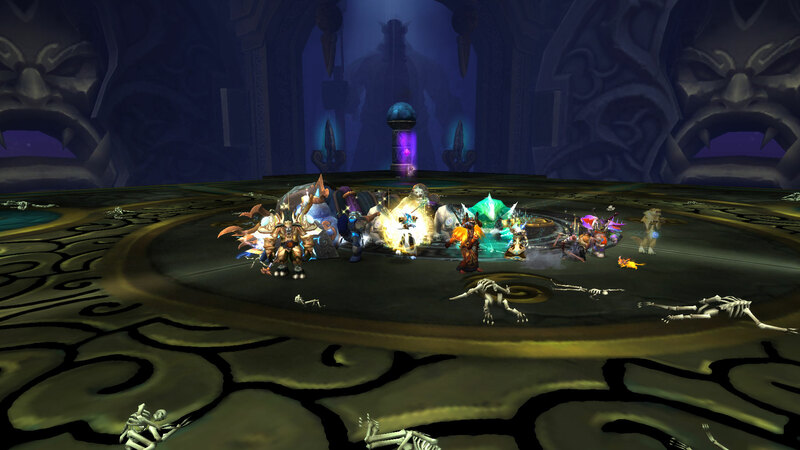 During tier 14, we finished Mogu’shan Vaults, but we didn’t complete the other two raids. In tier 13, we raided Dragon Soul, but we stopped raiding long before the end. I did manage to complete the raid before Mists of Pandaria was released, but it wasn’t with the guild. I was taking a break from WoW for much of tier 12. In my first time in the Firelands, I joined a PUG at the request of a guildie. They needed a healer for Ragnaros. I pointed out that not only had I never killed him, I had never entered the raid. They discussed it and let me join. I pulled him by accident before we were all ready. They didn’t kick me. We killed him, and I won loot. The next week, we finished Firelands as a guild. At the time, the guild hadn’t yet killed Ragnaros. When we killed the previous boss, my achievement suddenly popped for finishing the raid. While I completed the raid, I didn’t work for it all tier. In tier 11 I was with a different guild, Playground Brigade, made of friends I knew from out of WoW just for that tier. We fell apart in the middle of the tier. We were 5/6 Blackwing Descent, 2/4 Bastion of Twilight, and 1/2 Throne of the Four Winds. Tier 10 was my first current-tier raid. I had just hit level 80 and joined Carpe Flux Capacitor. I was an alternate, and my first boss was Deathbringer Saurfang. Maybe I wasn’t there from the absolute very beginning, but we pushed the entire tier, and yes, we finished the raid (as well as Ruby Sanctum). I mention all this because it means this is only the second raid tier for which I worked the entire tier with my guild and still completed. Carpe, thanks for being a great guild (and taking me back after my one-tier stint with another guild). Here’s hoping next tier goes smoothly well. Let’s take back Orgrimmar!